Upcycled Education: Homemade Dog Treats - Make That "Homecrafted"
We bought all organic products. Yep, only the healthiest for Jedi and his friends :) We found the ingredients at our local organic market. We baked two batches. The first batch without parsley, the second batch with parsley. I think the look/texture of the dried parsley and the nutrition it adds makes the parsley a must! Our neighbor and faithful blog reader suggested we roll out the treats between wax paper lightly dusted in flour as the first batch kept sticking to the rolling pin. The wax paper (we used freezer paper) was a nice rolling trick. Thanks, S! We took the leftover canned pumpkin and stuffed a Kong for Jedi and then froze it. He will love that delicious snack. He always loves a frozen Kong. When it was time to bag them up for the party favors, I jumped on Photoshop Elements 10 and made a label for the treats. You can see Lil O's faux business name. "Olive loves Jedi. Homecrafted Organic Dog Treats for a BFF - A Best Furry Friend"
And by the way, I designed the logo. Lil O said she envisioned something else. 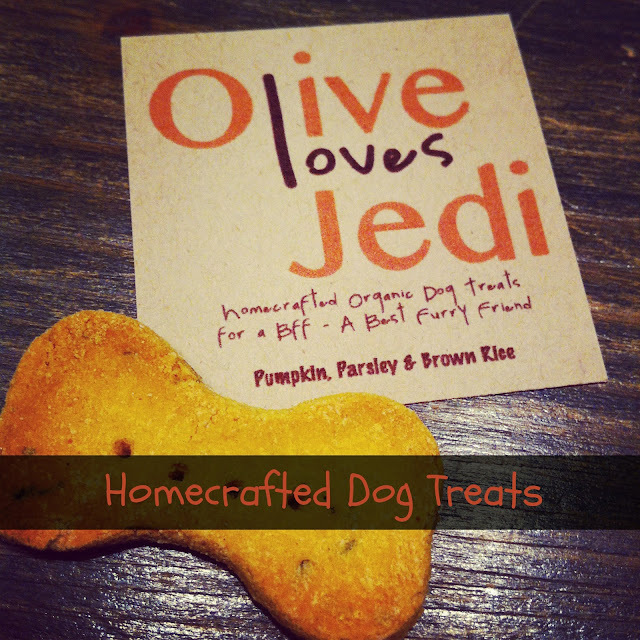 Jedi totally approves of these dog treats. He is like me and will eat just about anything with the word pumpkin in it. Remember this post here and my pumpkin fascination? While we are on the subject of dog treats, do you have a favorite dog treat recipe? I am looking for more recipes that aren't wheat-based. I think Jedi does better gluten-free like most dogs and humans.